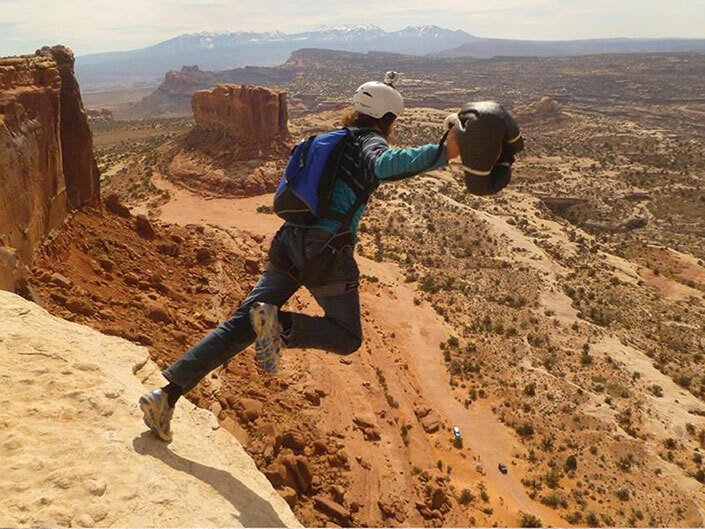 Climbing, slacklining, skydiving—Moab is a thrillseeker’s mecca. In recent years, this redrock paradise has become home to an elite group of athletes taking human flight to the next level through BASE and wingsuit jumping. Often considered the world’s most dangerous sports, the adrenaline rush is only part of the attraction. Since taking up the sports in 2008, Mitchard has completed roughly 500 BASE jumps and just as many wingsuit jumps. What is Wingsuit BASE Jumping? Wingsuit BASE jumping—a hybrid of skydiving and traditional BASE—requires an extraordinary level of awareness and piloting ability. Jumpers carry both a parachute and full-body “flying squirrel” rig that can reach speeds exceeding 100 mph. A flight lasts just 30 seconds…or less. Wingsuits arrived in Moab within the last few years due to technological breakthroughs that made shorter flights possible. Still, the area’s tallest cliffs are barely high enough for the most advanced equipment on the market. Wingsuit BASE jumping is still new at just a decade old, whereas BASE jumping blossomed in the late ‘90s. Today, there are an estimated 3,000 BASE and 400 wingsuit athletes active worldwide. 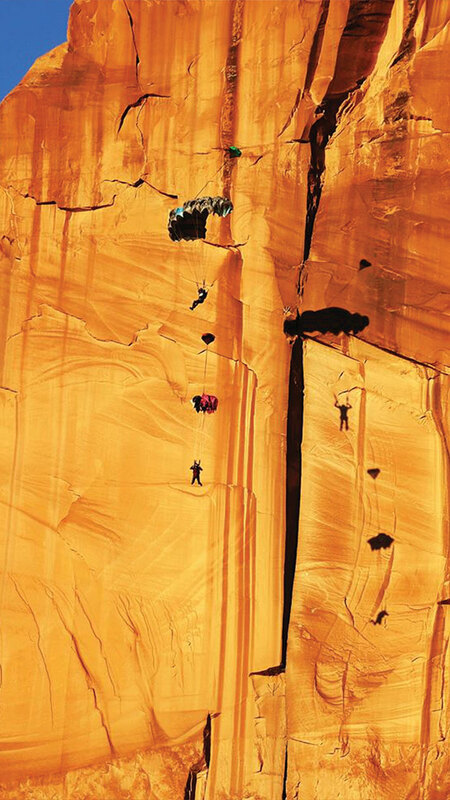 Moab’s easily accessible cliffs have established it as a destination for air sport enthusiasts. This backcountry area is overseen by the Bureau of Land Management and is the only place in Moab where extreme activities—like BASE jumping—are permitted. These sports are outlawed in many state and national parks, much to the chagrin of athletes like Steph Davis. A world-class climber, Davis founded her own BASE training and guiding service in 2011 called Moab BASE Adventures. Her company has fairly high prerequisites for those wanting to learn to BASE jump: a minimum of 200 skydives, a B license, and completion of a canopy control course. Davis says a common misconception about BASE jumpers is that they are all reckless adrenaline junkies. Some jumpers are engineers or pilots with military training, and most are very calculated in their approach. “It’s a very experience-based sport, and is really about evaluation and decision making,” she says. Most of Moab’s cliffs are in the 400-foot range, allowing very little margin for error. The chute is deployed within two seconds of leaving the exit. And because there’s no guarantee that a canopy will open flying away from the cliff, jumpers must be capable of rapid course correction to avoid striking the rocks. “We encourage people to have over 50 BASE jumps before jumping here so that you’ve dialed in the reaction time,” Mitchard says. The sport is largely dependent on weather conditions, and wind is often a factor when jumping in Moab. During the summer, heat exchange can create hazardous turbulence. Other dangers are the rocky terrain and small, treacherous landing spots. If a jumper overshoots or comes up short, their chances of safely setting the chute down are slim. The risks are many, but for those with a true passion for the sport—so are the rewards. As the popularity of BASE jumping continues to grow, Moab’s athletes are leading the way by pushing the limits and discovering new ways to soar. “There’s nothing I do that can compare with stepping off a cliff into the air and flying,” says Davis.